History was never my favorite subject growing up. (I was always a math and science nerd.) There were just TOO many things to keep straight and it always got super jumbled in my head. I’m trying to rectify the mess that is my history knowledge now that I’m an adult. 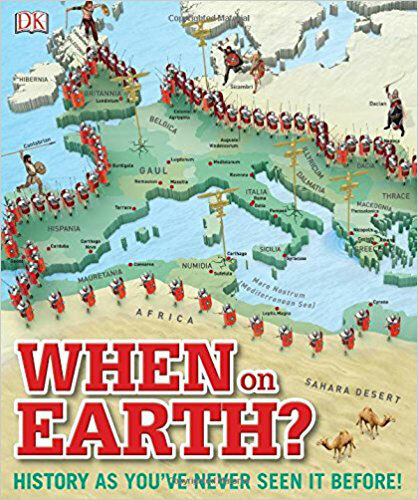 I have to say, even though a bunch of these resources are aimed at elementary school students, they are wonderful for those of us that really just need a primer on World History. What I also love is that unlike the dry, uninteresting text books I learned from as a child, today there are so many engaging options. My kids LOVE history. They would happily listen to their history books as bedtime stories, because they are so interesting, full of relatable people and exciting events. Now, you definitely don’t need ALL the history resources mentioned below. 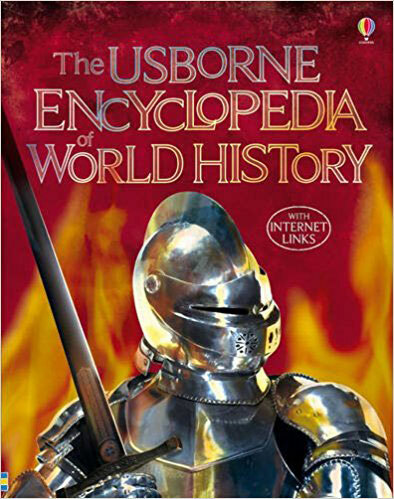 I recommend getting one storybook-like version (like Story of the World, A Child’s History of the World, or a Little History of the World) and one more visual, picture-heavy version (like the Usborne Encyclopedia of World History, the Kingfisher History Encyclopedia, DK When on Earth? 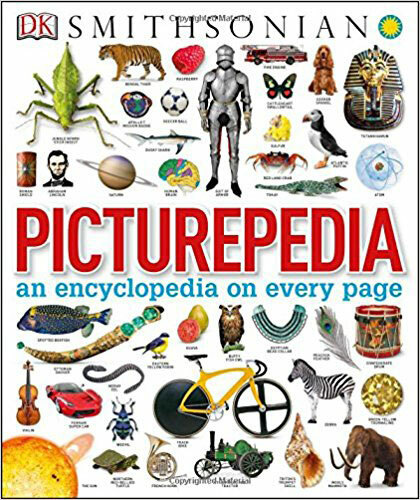 or Picturepedia). I feel like my kids (and I) retain information best when they hear it or see it portrayed in 2 or 3 different ways. Below you’ll find a growing list of books, games, audiobooks, and other resources for studying world history with a short description and review of each. 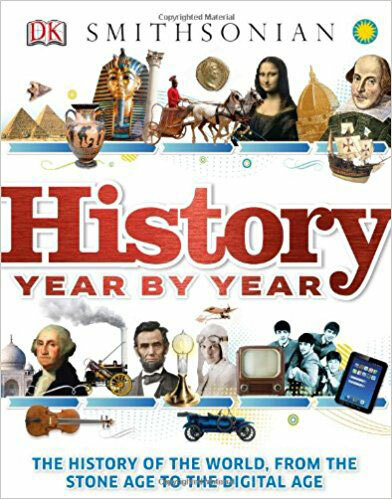 This is the history book that I use as my history spine with my kindergarten and elementary-aged kids. If they have heard a chapter in Story of the World, then I feel like we’ve covered the absolute bare minimum history for the week. I like to supplement with other books and hands-on projects or do some pages out of the accompanying activity guide, but when life gets busy, this is the one thing I definitely keep as far as history goes. The best part is that there is an audio version narrated by Jim Weiss, who as I’ve mentioned several times on this website, my family ADORES. Even the toddler is quiet when we listen to history in the car, because it is the same voice that tells him some of his favorite stories like the three little pigs and Goldilocks. We listen to Jim Weiss CDs so often, I’m pretty sure babies in our family emerge from the womb already in love with the sound of his voice. The author of this series, Susan Wise Bauer, is the queen of classical education. She is the author of the authoritative tome, The Well-Trained Mind. I do not consider myself a classical homeschooler, but I like to steal what I think works from all the different philosophies. These 4 history volumes are not exactly living books, but there is a lot of “living” in them. As much as possible, the author brings in interesting and relatable anecdotes or invents characters to allow kids to feel as if they were part of the story. As I mentioned, there is also an activity guide that goes along with each volume. When we were studying Ancient History, I did not purchase the accompanying guide. However, this year, as we study the Middle Ages, I am grateful for my guide. There are far more ideas for supplemental books, activities, and games than I could ever hope to find time to use, but I love that it gives so many options. 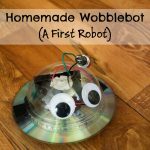 Whenever my kids find a topic particularly interesting, the activity book is a great place to start to find ideas for bringing the subject to life for my kids. 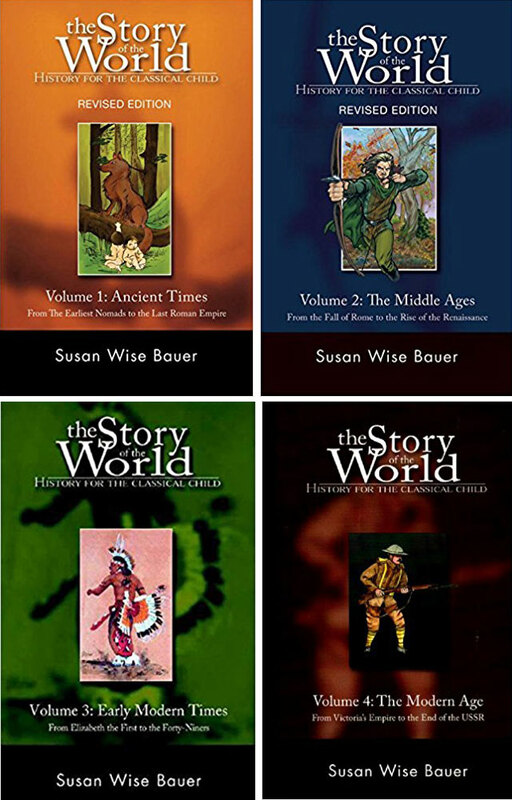 I haven’t read them yet, but Susan Wise Bauer also makes a similar history series for adults. I am really looking forward to making time to read these as well! 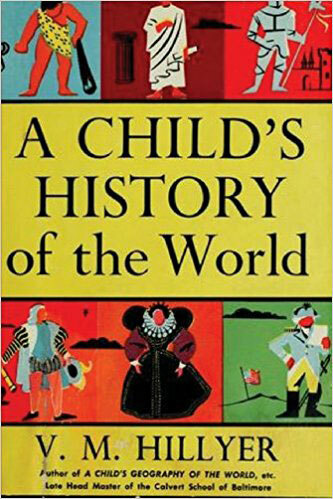 Although I haven’t read this book cover to cover, after we read (or listen to) each chapter of Story of the World (our history spine), I like to find the corresponding section in this book and read it to my kids a day or two later. I feel like that really helps them to retain whatever it is we’re learning. My dream is that once we’ve finished studying all 4 volumes of Story of the World, I will go back and read this entire book cover to cover to my kids. I’m hoping that will be a great refresher, reminding them of all the things they’ve learned and helping them to see the big picture. Honestly, I think of all the things we read for history, this might be the book that is the most memorable for my kids, especially for my 5 year old. It doesn’t have as much detail as other books in its 91 brief chapters, but the details it does include are usually pretty interesting. I enjoy reading it as well. Be aware, I have read online that there are some racist elements to this book. I haven’t happened across those yet. When I do, I don’t think it will stop me from continuing to read this with my kids. If anything, I’m hoping they will make good opportunities to open a dialogue with my children. Also note, I tried downloading the Audible version of this as well to listen to in the car and it was not my favorite. My family much prefers Jim Weiss. This game is a really fun, engaging way to get kids thinking about how to put history in order in their mind. The box consists of 110 small cards each featuring an event in history such as “Attila crowned King of the Huns,” “The Salem Witch Trials,” and “The Trojan War.” The two sides of each card are identical illustrations of the event with the exception that one side includes the year of the event and the other side doesn’t. Each players is initially dealt 4 cards. 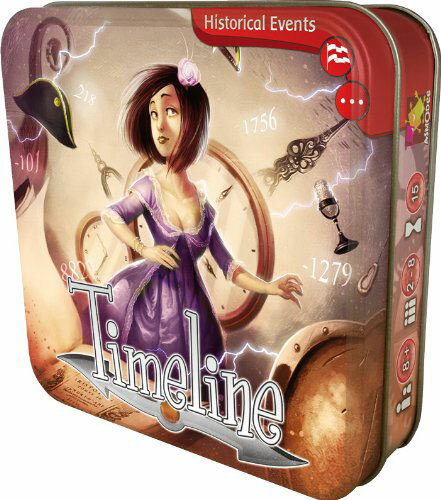 During each round, the players take turns trying to place one of their cards in the correct location within the growing timeline. If they place it in the incorrect spot, they have to draw a new card. The first person to get rid of all their cards wins. When I play with my 8 year old son I divide the cards into 2 draw piles, one filled with “easier” events for him, and one with more obscure events for me. With this handicap, he beats me more often than I beat him, but we’re both learning together! I’m hoping that eventually we’ll both be good at using the whole deck. This is my go-to textbook for presenting history to my young kids (the oldest is in second grade). The pictures take up more space than the words on each page. The font is pretty big (for a text book) and the discussion is very easy-to-understand. The illustrations are both colorful and engaging while also full of a surprising amount of detail. 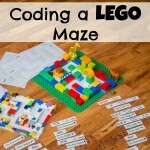 It is absolutely perfect for using with my second grader. First we read Story of the World, then we find the corresponding section in this Usborne Encyclopedia. When I make the time to complete these 2 steps of the process, I feel like my kids’ retention is SO much better. If you are looking for something for slightly older kids, I feel like the Kingfisher History Encyclopedia might be a better bet as there are a lot more words per page. However, don’t be deterred thinking that this Usborne version is lacking in information. In some ways, I’ve found the Usborne encyclopedia to be more thorough than Kingfisher. For example, my kids learned a lot more about the Vikings from the Usborne version than the Kingfisher one. However, there are other examples where the Kingfisher is slightly more thorough. Overall, they are both good options. Don’t feel like you need both. Even though we own this book, at present, I’m not really using it much. 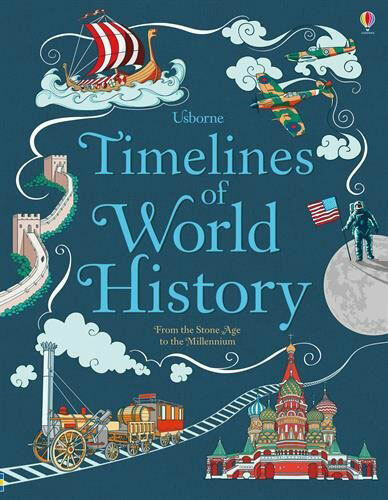 My oldest is in second grade and prefers the more illustration-based presentation of the Usborne Encyclopedia of World History. However this book is heavier on details (dates, names, places, etc.) Therefore, I’m really glad we have it in our personal library. I’m sure as my kids get older, this will make a great resource for when they are doing their own research on certain topics. 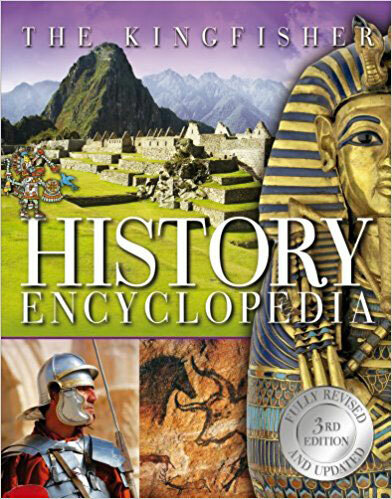 It is definitely a textbook and not a living book, so it would not be my first recommendation for presenting history in an engaging way to kids, but an encyclopedia such as this one definitely has values. (However, even though I did, I would not recommend purchasing both the Usborne Encyclopedia and the Kingfisher Encyclopedia). I think Usborne is better for kids under 9 and Kingfisher is probably better for kids over 9, but they are both perfectly adequate for the entire elementary school period (maybe even into middle school). This book is not really a stand-alone history spine. It’s too light on details to be used as a comprehensive history reference. However, it is GORGEOUS. I absolutely love it. It is divided into 4 sections: The Ancient World, The Medieval World, The Modern World, and the 20 and 21st Centuries. It consists of 68 3D maps on a variety of topics such as the Alexander the Great, Castles, French Revolution, and the Space Age. Each double spread map is not meant to be read sequentially, but rather pored over and explored in order to learn a bunch of unconnected details. I honestly like this book a lot more for me than for my kids. 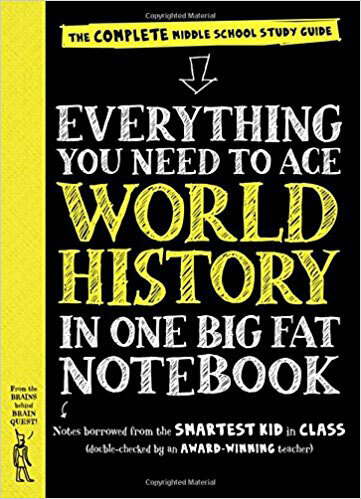 It is a beautiful supplement to history studies and I’m sure it would make a fun gift for a history buff, but it’s probably not great for exposing kids to historical periods for the first time. This book is very similar in concept to When on Earth? presenting history through a series of 65 2D maps covering a wide variety of topics. It is not as gorgeous in my opinion as When on Earth?, but it is probably more thorough overall. It includes smaller text and therefore a lot more of it per map. It also intersperses the maps with pages that are more textual and less image-based. I also like that along the side of each page it has a timeline showing when in history important events happened related to each map. Overall, the text is a little advanced for my early elementary kids, so we haven’t used it much yet. It will never make a stand-alone history reference, but I think it will make a fun supplement when they are older. If I had to choose one, however, I would probably choose When on Earth? over this book. 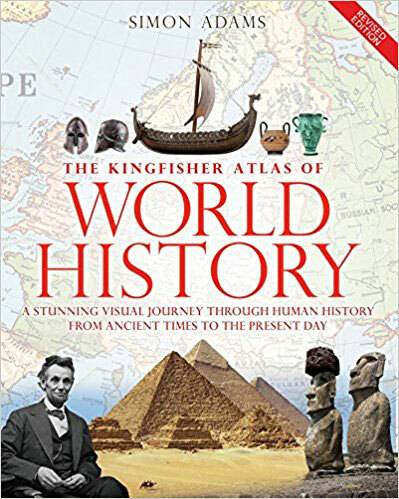 At first glance, the Kingfisher Atlas of World History appears meant for a younger audience than When on Earth?, based on the cartoony-ness of the illustrations. However, overall the text is a little drier and the pictures are a little less cool. This book is such an interesting idea, and yet I’m not sure how useful it’s going to be. If you’ve seen my free, printable blank world history timeline, which is organized by continent, this would be the perfect book to accompany it as it is organized in a similar way. At some point, I can definitely see us using this book to help fill in our timeline. Each double-page spread covers a certain period in time, like 250 BC to 1 BC or 1680 to 1699. By the very end of the book, it goes in 5 year increments. On each double page spread are 4 columns each covering a different geographical area of the world. Each section is filled with dates and events which are interspersed with pictures. If you have ever thought to yourself, “Hmmm…I wonder what was happening in South America in 200 BC,” this would be the perfect resource for you. (Apparently, between 200BC-AD600, the Nazca people of Peru were carving giant spiders and other images in the desert.) However, this is definitely not the sort of book you would read cover to cover or use as your primary history source. 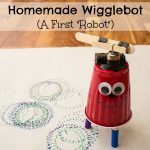 It’s very interesting and unique, but probably not super useful to most families. 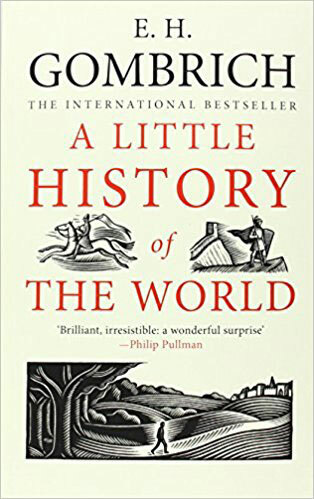 This book is a great chronological overview of everything that happened in world history. It is essentially one really long timeline filled in with both words and photographs. Using this book has made me realize that a lot of Story of the World (our history spine) is slightly out of chronological order. This makes sense as the author of Story of the World likes to tell a story about one people or area of the world, before moving on to the next. That just involves a lot more jumping around in time than I might have otherwise imagined. This is another book that is probably not appropriate for every family, but I would definitely recommend it for a child who is interested in history. It has a lot of interesting facts, though for the most part, those facts are rather isolated. It is not a great standalone resource, but a superb supplement. It is great for putting all of history into perspective or to assist in putting together your own timeline (such as my free printable blank world history timeline). Like A Child’s History of the World, this is a fairly old book that gives a brief, general overview of all of world history. I don’t typically read this to my kids as I feel the language is a little too dry for them and I lose their interest (my oldest is only 8). However, I think it would make a decent read (if not a great history spine) for kids in middle to late elementary. The story of how this book came to be is also fascinating. It was written by someone who specialized in Art History and couldn’t find a job as a textbook for German children just before World War 2. I’ve seen several reviews complaining about how Eurocentric his account of history is. As I said, I would not use this as a history spine, but it’s definitely a reasonable way to get all of the highlights from world history straight in your mind in a short period of time. As a certified nerd who loves taking notes, I’m kind of intrigued by this series of books. I recently found them for $9 each at Costco and bought the ones for World History, American History, and Science. The subtitle is: Notes borrowed from the smartest kid in the class. Basically, the whole book is made to appear as if it were someone’s notes written on lined paper. There are pictures, highlighting, diagrams, and even some doodles. In some places it even looks like other pieces of paper are taped inside. It’s really a neat idea. Anyway, I haven’t actually USED this book yet, but these are my first impressions. It’s 500 pages long, but there are not many words on each page (remember it’s supposed to look pseudo-handwritten), so really, it must be pretty light on actual content. There is no index, which would probably make me a little insane if I were trying to find something in particular. From looking at the Table of Contents, I don’t see sections on Ancient Egypt or Vikings (two of my kids favorite topics). Looking through it, I do see it discusses Ancient Egypt in the section on Ancient Africa (duh). Overall, I do not think this makes a good reference book. For example, suppose I couldn’t remember who Charlemagne was or why he was important. I could not use this book to solve my problem. This book would definitely not make a good history spine. You are going to need other resources as well. However, I do think it would make a good review book for AFTER you’ve studied world history. Like it promises, it would be a little like reviewing your notes that you’ve taken during a course based on a thicker more thorough book. At the end of each chapter it has a section called Check Your Knowledge (note that answers are not provided). I could see myself asking my son in a few years to go through this book and make sure he could answer all those questions. Also, despite it’s shortcomings, I still think the concept for these books is pretty darn cool. This book is absolutely gorgeous. It covers the areas of Science and Technology, Nature, Geography, Culture, Sports & Hobbies, and History. There are only about 50 pages devoted to history. However, those pages are jam-packed with information and fascinating, high quality photographic images relevant to all the highlights of world history. I can not say enough positive things about this book. It practically doesn’t matter what topic we’re studying…space, the human body, Vikings, ecosystems. If I want to show my kids impactful images, I know to check this book first. As far I’m concerned, it should be in everyone’s library. Click here for more History activities for kids. i feel it may perhaps be not a good idea, to not be able identify what is or isn’t racist..in these old books you have..my old child-craft encyclopedia, had bright pretty pictures of Columbus and the Indians, and nine planets!..things evolve..as WE must..no?? Hi, Mike! Thanks for your reply. I’m not sure I understand what you mean…I haven’t run into any questionable material in these books so far, but I did read some reviews that mentioned concerns. Personally, I want my kids to be exposed to all viewpoints. Any viewpoint that I think has evolved since the writing of these books (or that I disagree with) will be used as a jumping off point for what will hopefully be informative, thought-provoking conversations for my kids (and for me! ).